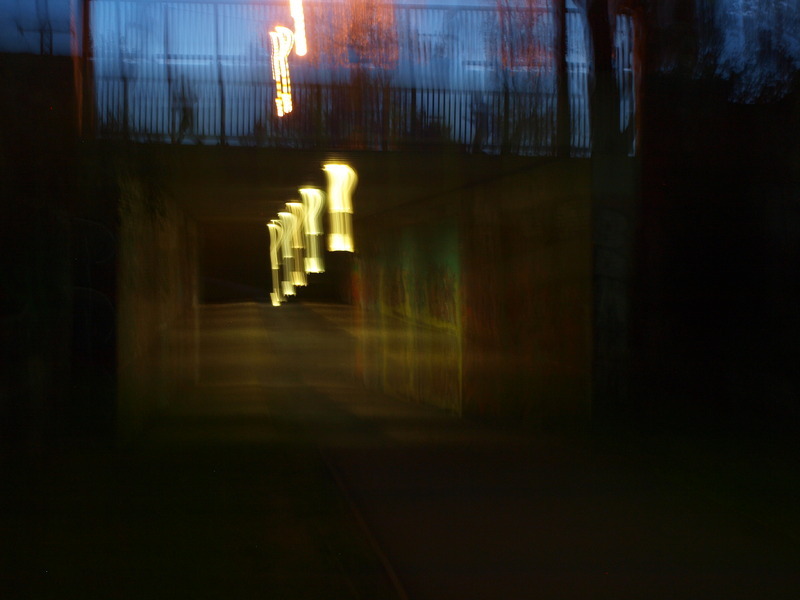 The tour begins with the idea of ‘transition’ in the spatial form of a tunnel and the liminal time between dusk and nightfall. This starting point is designed to symbolically transition the participant from the habits of their daily routine into the atmospheric landscape of the tour. In the tunnel, the uncanny manifests in shadows and echoes. As the point at which night encroaches upon the hegemony of light and vision, dusk bears traces of both light and shade. At dusk the definition, outline and certainty of shapes afforded by daylight shifts and merges into shadows and becomes spectral. The tunnel’s thick stone walls stage the play of shadows; as participants pass through the tunnel, they are followed by their shadow-double stretched and flickering along the walls. This shadow mimicry recalls Derrida’s comments that the uncanny evokes ‘a stranger who is already found within, more intimate with one than one is one’s self’ (1994, 172). Echoes reverberate off the cavernous walls, surrounding and encircling the participant on all sides and confounding their ability to situate sounds spatially. In the absence of abundant light, an awareness of threat or danger in the space is indexed through noises. Listening becomes as Barthes notes, a ‘defence against surprises’ (1991, 247). In the enclosed tunnel space, like the shadows, echoes are experienced as indistinct noises detached from their source of origin. While footsteps, voices, and incidental noises are recurrent features of the city soundscape, in the disorienting context of the tunnel they are rendered strange, illegible and uncanny. “Towards Darkness,” Street Art deTours, accessed April 20, 2019, http://streetartdetours.com/document/1081.